Welcome you to Inkido Blog Hop!!! If you came here from Yasmin's blog, then you are almost through:) Inkido blog will be your next and final stop. By now I guess you visited all members of our DT and found out something about them. 1. If I would have to use for a month the same color combo my choice would be: whatever, as long as it includes white gesso. 3. When taking photos , I scrap them already in my head . 6. I keep my pages in plastic pockets, in a box. Some are framed and hanging on the walls. For a chance to win our RAK, please leave a comment on each blog from the list, like our FB page , make your way to Inkido blog and tell us if you liked it. We will draw two prizes of beautiful Inkido stamp sets for two lucky winners! 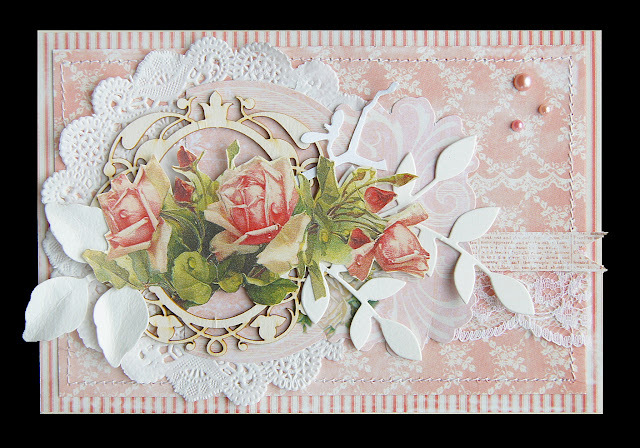 My inspiration for this card comes from an amazing scrapper Zielonooka and her stunning card which is our theme this week in the Lift project 2013. I guess I wandered quite far away from the original, but the inspiration is definitely there! Thanks for stopping by and good luck in our Blog Hop! Доброе утро! Рада знакомству! с удовольствием стала вашим ПЧ! странички - супер! великолепны!очень очень нравятся! Спасибо за блог-хоп! Very beautiful and delicate card! Nice to meet you with your blog. This card is so gorgeous! Thank you for the inspiration! Рада знакомству. Просмотрела Ваши работы и мне понравились странички. Они такие воздушные. Спасибо за шанс выиграть. Beautiful card...love the soft colors! Hi! Love your blog and that card is stunning!!!! I live in the USA in Alaska. I am KathyinAlaska on scrapbook.com and hope that you will visit me some time. Thank you for the bloghop and the chance to win your prizes!!! Очень понравились работы!! Рада знакомству! с удовольствием буду читать блог!! Such a heavenly card you have inspired me ! Thank you! Such a beautiful card! Love the soft colors and details! Don't know the original but your lifted card is beautiful! Your card and other projects that I peeked at on your blog are lovely. Very soft and feminine. Thank you for sharing! Just hopping around having fun and admiring all the gorgeous Inkido pieces of art. new follower , love to read about you and hoping is fun .your card is awesome ..very beautiful.